/Design Tools - Backgrounds /Can I just make the background be a solid color? Yes, you can make the background a solid color by following the steps below. Locate the “Backgrounds” tab on the left side of the design center — it’s the second icon down. The Backgrounds toolbar will appear. The first option on this toolbar is the Solid Color option. You’ll see that there’s a list of colors already used in the design, and also a space for you to enter a code to apply a new background color. To find a new background color, click on the Color Wheel icon located to the right of the colors used in the design. Here, you’ll be able to drag the cursor to choose any color of the rainbow. As you search for your desired color, you’ll notice that the color code above changes with it. When you find the color you want, hit the green “Apply” button next to the color code. This should add your chosen color to the background of your design. If you don’t like the results, you can always choose another color and hit “Apply” again. Remember that you have a handy list of colors that are already used in the design. 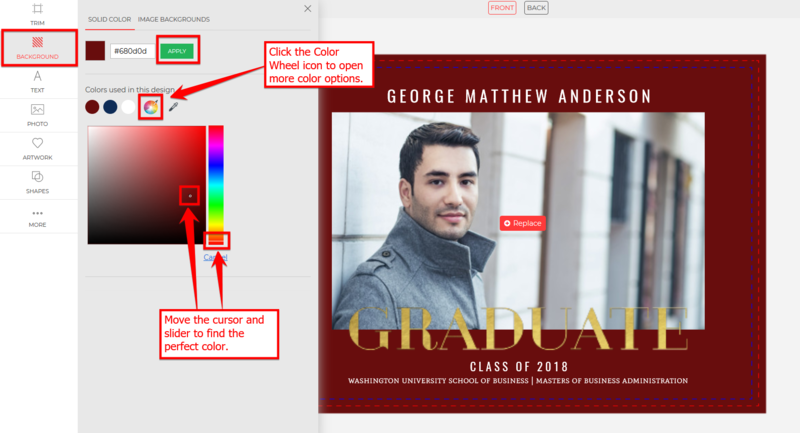 Keep in mind that you can also utilize the eyedropper tool to find a color of a photo or embellishment that’s used in the design. You can view an example of this here.